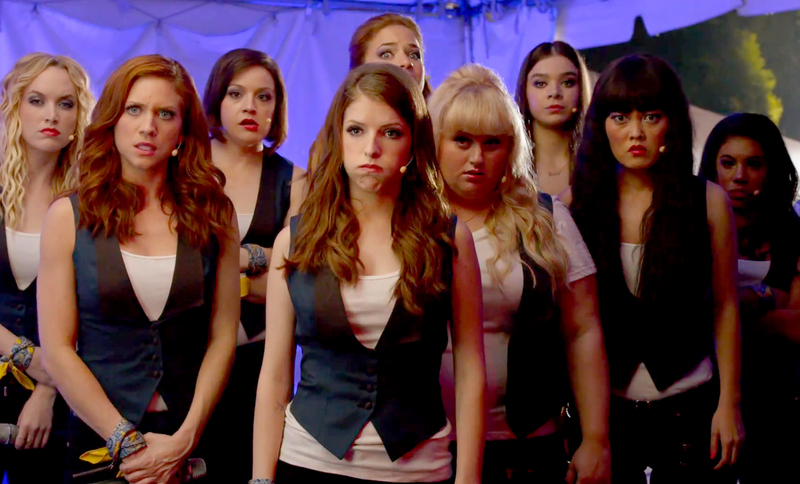 Film Review: ‘Pitch Perfect 2’!! I walk up the ramp into the auditorium and am greeted by a local glee club. Not too shabby a beginning for a screening. Well done, kids! The Universal theme music was redone by different a capella pairing you might recognize, amazing how close to the instrumental score the performance was. Picking up nearly where the first film left off, it is the Lincoln Centre competition again. The Barden Bellas are the three-year reigning champions, a special guest in the audience (Yep, I’m not going to tell you who). The girls take the stage and the performance loaded with gimmicks and props. Descending from the ceiling wrapped in large drapery is Fat Patricia (who will always be “Fat Amy,” of course). And what no one would ever want to see happens. A loud rip and slow spin and Fat Amy fills the heavens with her glories. “Muffgate” fills the news broadcasts and even scores a comment from a character played by Rosie Perez (talk about your blast from the past). I haven’t heard a voice like that anywhere else. Needless to say, the Bellas are suspended. As champions they are permitted to compete in the World A Capella Championship. If they win, they are re-instated. But can they do it? Gail (Elizabeth Banks), one of the two American judges, says, “The whole world hates us.” I don’t want to give too much away, but I will say that John, the other judge, brings his “A” game when it comes to misogyny. I smacked him twice, in my head. All of the memorable Bellas return in this sequel: Beca (Anna Kendrick), Chloe (Brittany Snow), Fat Amy (Rebel Wilson), Lilly (Hana Mae Lee), Stacie (Alexis Knapp), Cynthia Rose (Ester Dean), and Aubrey (Anna Camp). They are as sassy and talented as ever. Don’t worry, your Treblemakers are back as well, at least Jesse (Skylar Astin) and Benji (Ben Platt), clearly a few have assumedly graduated, but a particular one has returned. One of the best surprises in the film was the appearance of Keegan-Michael Key as Beca’s boss. Straight out his comedic brilliance of his hit TV show on Comedy Central, “Key and Peele,” Key is humorous as the music producer. New Bellas are introduced; Emily (Hailee Steinfeld) “The Legacy” is the daughter of Katherine Junk, an infamous, former Bella, played the infamous Katey Sagal. Emily is the typical eager freshman with a stroke of genius hidden within. The most memorable, aside from the “legacy,” is Flo. Flo (Chrissie Fit) is a South American foreign exchange student. Fit portrays this matter-of-fact Latina well. Apparently, Flo hails from a rather hellish upbringing, which provides quick quips of tragic hilarity. Pitch Perfect 2 is, as was expected, a hilarious comedy. The cinematography was a little off for me. The film’s overuse of extreme close-up, slow motion and quick pans gave me a bit of a headache at times. During a Treblemaker party, these techniques were used and it made the party too artificial. A great buildup was made between the Bellas’ and their competitor. I expected a lot more out of the ending. Despite these technical follies, Pitch Perfect 2 is a good time. Any lover of music and comedy will definitely enjoy this film. One small spoiler – a hot all male group singing “Bootylicious.” Unbelievable. Elizabeth Banks sets Her Directorial Debut With…. This entry was posted on Friday, May 15th, 2015 at 8:15 am	and is filed under Film, News. You can follow any responses to this entry through the RSS 2.0 feed. You can skip to the end and leave a response. Pinging is currently not allowed. « ‘The Craft’ Is Taking A Turn In The Remake Machine!!! How you doing? I'm Chili Palmer. Jesus, if I have a heart attack, I hope you know what to do.